Are you hungry after getting plastered with your friends after a night out? Do you have leftover rice in your fridge from the other day and still haven’t used it? 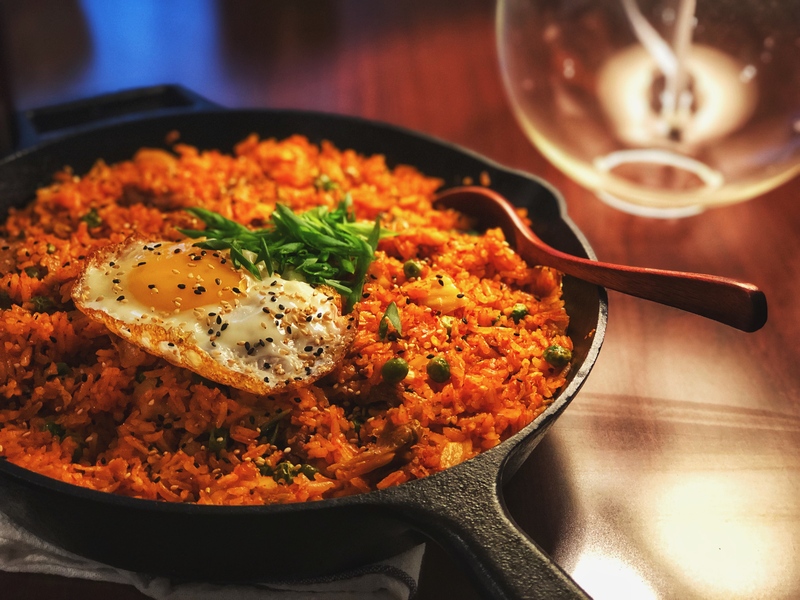 What if I tell you there’s a simple dish that can solve both of these problems while fulfilling the need for some warm, spicy, greasy goodness that every drunk person craves at 2 in the morning, kimchi fried rice! ½ lb of thinly sliced pork belly or beef brisket. You can find them in most East Asian stores, for stir fry, hot pot, K-BBQ or shabu-shabu, they are thinly sliced fatty/flavorful cuts of beef or pork. ½ lb fish cake, roughly chop them into smaller pieces, you can find them in most Asian stores as well. Any mushroom, it can be White Button, Crimini, Portobello, Maitake, Shitake, Oyster, King Trumpet, literally any non-poisonous edible mushroom can improve a fried rice dish. Add whatever you want or like! In a small pan, cook the onion on medium heat until they turn semi-translucent which takes about 5-7 min, then lower the heat to the lowest setting possible and slightly toasts the chopped kimchi for another 3-5 min. While the onion is caramelizing or the kimchi is toasting, heat up your average frying pan/skillet over medium-high (dry pan, no oil) for about 2 minutes, then add the oil, swirl the pan until a thin layer of oil covers the whole flat surface of the pan, wait until it smokes slightly, then add the rice in the pan, you want to hear the crackling of the rice right away and scramble the rice to make sure almost every grain is covered with the oil. Add the caramelized onion + toasted kimchi into the rice pan, maintain the same level of heat, mix everything for about 1 min while adding some liquids from the kimchi container (about a tablespoon). Turn off the stove, using the remaining heat in the pan, add the gochujang, soy sauce, butter, and sugar into the pan at the same time, stir and mix until each grain of rice is covered in an amazing sauce! Taste to see if any more salt is needed since salt level in soy sauce can differ from brand to brand. Chop some scallion and mix into the rice before serving/eating, and enjoy! Okay, so this is the easy version, how do I make it fancy? Well, it’s actually simpler than you think, other than adding any one or all of the stuff recommended above, like pork belly in the fried rice or a couple of fried sunny side up on top, there is an important step that will take this dish from a 10 to a 15! (Optional Steps) Heat up a cast iron pan on medium high for about 5 – 7 min, don’t add the anything to the pan until the pan is all heat up since it will either smoke or stick a lot. (Optional Steps) When the pan is heated (place your palm about 3 inches above the pan and you should not be able to hold for more than 3 seconds), add in about 2 tbsp of sesame oil. Swirl the pan around and let the oil cover the pan, and part of the edge. (Optional Steps) Add the fried rice into the hot oiled pan, you should hear a lot of sizzling, which means the bottom layer of rice is being fried to become the most perfect gold crisp rice, turn the heat down to medium and let it sits on the stove and “fry” for about 2 – 3 min, then turn off your stove, and let it sits off the stove for another 5 min before serving! These little 3-steps create the most amazing layer of crunchy rice, the Chinese call it 鍋巴, the Persians call it Tahdig, and the Spaniards call it Socarrat, which all are basically the same thing, a golden layer of crispy rice fried to perfect, hidden under the tender rice on top, just like 누룽지, the crunchy rice you can find in probably one of the most famous Korean dishes, hot stone bowl bibimbap! Though it seems like a lot of work, this step elevates the dish to the next level, and with a couple of gold crispy fried sunny side up eggs on top, sprinkling on some toasted sesame seed, it’s becomes something truly amazing! Ps. Don’t forget to have an oven mitt on when heating a cast iron pan on high, it can burn you. Also, we are cooking high temp, so, even though I said anyone can do it, still be careful so you don’t burn down your house or something! Other than that, enjoy the dish!